Here we have one of several great photos taken by the fab freeway terror Gina Stevens (A.K.A. Vox Kali in the show character art above). 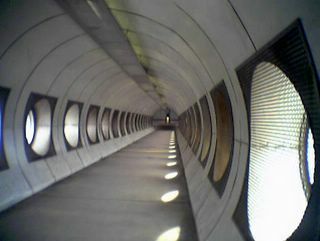 The, again, very spacey Logan's Run-ish Joe Lewis arena tunnel. Mad 60s funky space vibe. Camera phone image.